Matthias Schulz, flute, was born in Vienna in 1972. He studied with his father, Wolfgang Schulz, at the Vienna University for Music and the Performing Arts and privately with Aurèle Nicolet as well as with Maxence Larrieu at the Conservatoire in Geneva. In 1989, while still a student, he was awarded first prize in the national “Jugend musiziert” competition. In 2002 he completed his studies in instrumental performance with distinction. 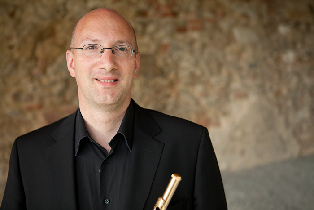 Since 2005 Matthias Schulz has been engaged as a flautist with the orchestra of the Vienna State Opera. He plays regularly with the Vienna Philharmonic, the RSO Vienna, the orchestra of the Vienna Volksoper, the Vienna Chamber Orchestra and as a flute soloist with the Vienna Johann Strauss Orchestra. In 2002 he was invited by the maestro John Neschling to play as solo flautist with the Symphony Orchestra of the State of Saõ Paulo. As a soloist he focuses on work with the Lower Austria Tonkünstler Orchestra, the Vienna Chamber Orchestra, the Bruckner Orchester Linz, the Mozarteum Orchestra Salzburg and the MDR Symphony Orchestra of Leipzig. The highpoints of his concert work to date include his solo accompaniment of Jessye Norman in recitals in the Großer Saal of the Wiener Musikverein in 1997 and at the Salzburg Festival in 2000 and his performance of Herbert Willi’s Double Concerto in Tokyo’s Santory Hall with the New Japan Philharmonic Orchestra under Christian Arming in 2008. His work in the field of chamber music has seen him performing with a range of ensembles at the Salzburg Festival, the Musiktage Mondsee , the Neuberger Kulturtage, the Salzburg Mozart Week, the international Beethovenfest in Bonn, the Carinthian Summer Music Festival and the Allegro Vivo Festival. Since 2009 he has played together with Herbert Maderthaner, Daniel Ottensamer, David Seidel and Jonas Rudner in the Baole Quintett Wien. Having already toured China during its first year of existence the quintet has since played at a number of festivals as well as appearing regularly at the Wiener Musikverein. A number of CD recordings by Camerata Tokyo document Matthias Schulz’s musical achievements.